Did Kangana Ranaut And Ekta Kapoor Have Differences While Shooting For Mental Hai Kya? 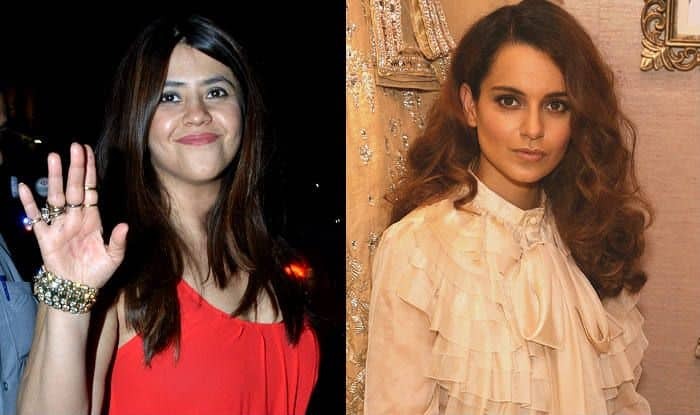 Actor Kangana Ranaut might just have had some creative differences with Ekta Kapoor, the producer of her upcoming film. A report in a daily suggests that the actor, who’s currently working on Mental Hai Kya with Rajkummar Rao, had a difficult moment when Ekta introduced some changes in a scene featuring her. Kangana and Ekta Kapoor are strong-headed women, who are considered as a few who don’t shy away from calling a spade a spade. The actor doesn’t fear to comment on other actors, filmmakers, politicians, and even her past and present relationships. Similarly, Ekta, too, has always been vocal about her choices, the kind of content she endorses and how she is just not scared of anyone including the Censor Board. In fact, she is considered as the czarina of Hindi television who changed the dynamics of daily soaps and introduced some of the most loved and hated characters on the small screen. Kangana Ranaut has had tough relationships with many people in the industry, right from Karan Johar, Hrithik Roshan, Shekhar Suman, Aditya Pancholi to Shahid Kapoor, Deepika Padukone, director Krish, Hansal Mehta, and writer Apurva Asrani among others. She also talked against Ranbir Kapoor, Alia Bhatt and Aamir Khan recently, questioning them for not supporting her films.